“Approximately?” “Yes.” “Not sure?” “No. His birth has not been recorded on Earth. He may be a little older but this is no cause for concern. He is well-suited for what we have in mind.” This was no light conversation. A seemingly simple dialogue between these two individuals was interlaced with dangerous resonances. It would have explosive ramifications if all went well, as per plan. Their strategy, this time, was modified. It was modulated to thwart the interference of other celestial bodies, or so they thought. Were they right or would their calculations, once again, go awry? ‘TIME’ alone would tell. 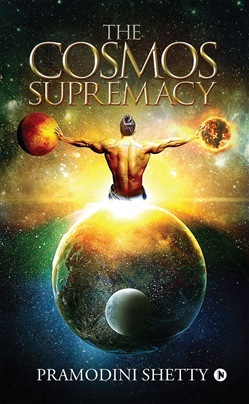 Acquista The Cosmos Supremacy in Epub: dopo aver letto l’ebook The Cosmos Supremacy di Pramodini Shetty ti invitiamo a lasciarci una Recensione qui sotto: sarà utile agli utenti che non abbiano ancora letto questo libro e che vogliano avere delle opinioni altrui. L’opinione su di un libro è molto soggettiva e per questo leggere eventuali recensioni negative non ci dovrà frenare dall’acquisto, anzi dovrà spingerci ad acquistare il libro in fretta per poter dire la nostra ed eventualmente smentire quanto commentato da altri, contribuendo ad arricchire più possibile i commenti e dare sempre più spunti di confronto al pubblico online.